Lucy Brierley does it again! For the 3rd Nationals running Lucy Brierley has won the Girls Doubles title. She won this year with partner, Kent’s Sofia Bao. The U13 English National Championships took place at Birmingham University on Saturday 23rd & Sunday 24th April 2018. Being seeded number one the pressure was on to win their group on Saturday. They did this comfortably only losing 14 point in the first match and 13 in the second to come top of their group. This put them into the semi-finals. The semi-finals brought them up against Carly Stephenson, Leicestershire and Lila Dundas, Surrey. They lost the first set 19-21 but won the next 2 sets 21-16 21-12 to reach the final. The final was against number 2 seeds, Grace Sachdeva, Yorkshire and Emily Chen, Hampshire. A battle was expected as Lucy and Sofia had not beaten them all season. They dominated from the first point to the last and won in 2 sets 21-7 21-10. The opposition never saw that coming!! Both Lucy and Sofia are very pleased with the result and are proud of their victory and title of GD U13 English National Champions 2017-18. In the Girls Singles Lucy won her group and the quarter-final with ease. On Sunday she fought through her semi-final winning 28-26 21-17 and produced another great performance in the final, narrowly missing out and gaining a Silver medal. Seeded number 1 with her partner Berkshire's Dillon Chong in the Mixed Doubles, they progressed with ease to the semi-finals. Dillon and Lucy then played a fellow Notts player, Matilda Franklin and Cumbria's Dan Kemp for a place in the final. Dillon and Lucy won a hard fought match and went on to win Gold convincingly in the final beating Sebastian Grove and Lila Dundas Surrey. This takes her tally of English National medals to 5 Gold and 2 Silver. 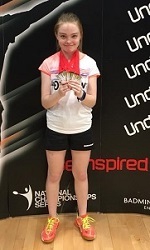 The previous weekend her sister Megan won Gold in the Girls Doubles U15 English National championships. The Brierley household has double doubles champions! A special thanks to Pete Mills and Kerri Scott who coached them at both events.